Cayetana: If you guys were action figures what would come with you? Caves: Lou would come with an imaginary German Shepherd (dog) because she had one in real life (imaginary). Minty would probably come with a bazooka made of pizza and sparkles that shoots rainbows quite a long distance. Cayetana: What's your favorite city to play in? Caves: London has always been good to us and we love to play house shows...so playing house shows with our London buddies at Astbury Castle is always a real fun time. Cayetana: If you could play one album to an alien, what would it be? Caves: We would almost definitely play them Pod by The Breeders and Get Disowned by Hop Along. They're both so good that any strange alien chap would relate to them and, if they had limbs, they would totally dance them off. Cayetana: What is your favorite guilty pleasure music that you both agree on? Cayetana: Do you have any strange pre-show rituals!? Cayetana: What was the first song you ever wrote about? Caves: Neither of us have ever written about a song before. But the first song we wrote was about the distance between love. Even though they're 200 miles away, they'll make you feel better. Cayetana: Who was your favorite Spice Girl, does Meatloaf ever drive your bus? Caves: Lou was way into Scary Spice. She even had a Scary Spice doll in a tin. Minty prefered Ginger Spice but can't recall why. She was sassy but not too sassy, y'know? Meatloaf is welcome to drive us any time. If you're reading this, Mr. Loaf, give us a call. Scene Point Blank: How was your Fest 12 experience? Caves: Fest 12 was cool. It was much like the previous Fests, only this time we had Dos from Spraynard playing drums for us and it was an amazing dream come true. 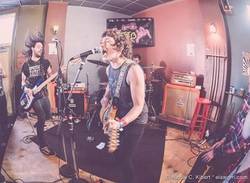 Scene Point Blank: Did you check out Cayetana's set? What stood out? Caves: Yes they played right before us and we used all their gear because they are kind angels! They were super-rocking excellent and their tightness was a standout feature of their set. Scene Point Blank: What stood out about your own set? Caves: Well, lots of our friends from all over the globe were there to party rock with us. Marky from Hop Along crowdsurfed and that was a sight to see. Scene Point Blank: What's your "must do" act at Fest every year? Is there a band or restaurant you go to every year? Be in the pool in pool party. Reggae Shack super crazy jerk tofu. 5 Star pizza in car park. Scene Point Blank: Is there such a thing as too much PBR? Words by the SPB team on Nov. 12, 2014, 3:19 p.m.
Posted on Nov. 12, 2014, 3:19 p.m.
Posted Sept. 14, 2014, 8:39 p.m.
Posted Sept. 8, 2013, 9:05 a.m.
Posted June 16, 2013, 11:28 a.m. The upcoming new album from UK band Caves, Betterment, is now streaming at their bandcamp. Vinyl will be releaesd on Yoyo Records, with CDs courtesy of Bombed Out.